October was a time not only for endings, but also for new beginnings. Autumnal variability finally triumphed over the stubborn and stable summer pattern that had controlled Washington's weather since late July. Active fires, poor air quality, hot weather, and long dry spells all came to a close in October. However, October also featured the first frosts and first fall rains, as well as the first storms of the autumn and the inaugural snowfall in the mountains. This October was truly a microcosm of an entire weather year condensed into one month. A shot of northerly flow early in the month ushered in very cool minimum temperatures east of the Cascades, including a low of 18.4 degrees at Pullman on October 5th. As extremely dry continental air entered the region, winds gusted to 58 mph at Snipes in the lower Yakima Valley, and dew point temperatures fell as low as 10 degrees. 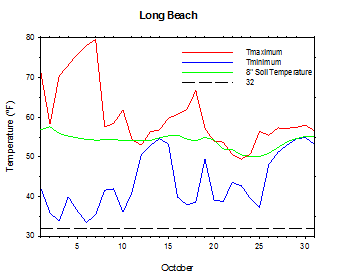 However, sunshine and mild day-time temperatures continued, and Long Beach reached nearly 80 degrees on October 7th. Following several months of dryness, heavy rain finally arrived in western Washington during the weekend of October 13th/14th, as a strong jet stream forced a subtropical surge of moisture into the region. Overnight low temperatures warmed significantly with the arrival of a stormy pattern around mid month, as dew point temperatures soared above 60 degrees in some areas. Pasco dropped to only 60 degrees on the morning of October 15th. Very windy conditions on October 16th were highlighted by sustained winds of up to 36 mph at St. John. A large trough arrived on October 20th and brought cool day-time temperatures along with the season's first snowfall to the Cascades. In fact, chilly and rainy conditions made October 22nd the coldest day in south central Washington since March, with highs only climbing into the upper 30s and 40s. Following an unusually cool, unsettled, and spring-like week, the final five days of the month saw a return to active but mild conditions. Highs warmed into the low 70s around the Tri-Cities on October 29th, while lows fell only into the mid 50s. Periods of heavy rain affected western Washington, and Long Beach ended the month with nearly 13 inches of rain. Overall, October temperatures were somewhat above normal. In spite of the rain-free first eleven days of the month, much of western Washington received rainfall on most of the remaining days of October. 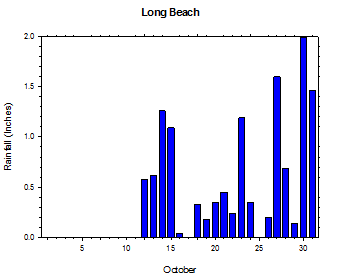 In fact, Long Beach experienced 13 dry days last month, although only 2 of them occurred after October 12th. Even areas east of the Cascades experienced a few rainy periods during the latter part of October, such that the entire state had received measurable rain before month's end. Notably, Pullman ended a 103 day stretch of dry weather on October 12th. Warm weather on October 1st yielded to an approaching dry cold front, as cool and clear continental air worked into eastern Washington on the heels of gusty north winds. Temperatures on the afternoon of October 2nd were in the mid 70s to low 80s in south central Washington, but only the mid 50s to around 60 around the Okanogan region. Normally, the two areas have similar day-time temperatures. On the morning of October 3rd, dew points as low as 10 degrees allowed for isolated cold temperatures that were the lowest of the season in many cases. Lows were highly variable depending upon wind speeds, with calmer areas dropping into the 20s. Ritzville and Pullman fell below 25 degrees. Winds during the night of October 3rd peaked at 42 mph (15 minute sustained average), and gusted to over 58 mph at Snipes in the lower Yakima Valley. Sustained winds of 30+ mph were reported across parts of eastern Washington. October 3rd was the first cool day of the autumn east of the Cascades, as near to below normal temperatures persisted through October 6th. Highs in central Washington were in the low to mid 60s, while eastern Washington peaked in the upper 50s. Western Washington was warmer, with highs in the 60s to around 70. Lows ranged from the 20s to 40s. 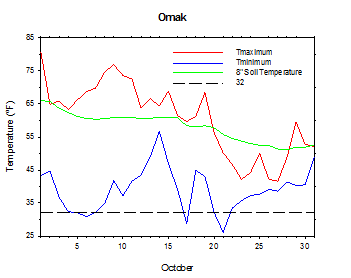 On the morning of October 4th, lows ranged from 21.6°F at Pullman to 48.4°F at Tokeland. October 4th was a similar day, with highs varying from the low 70s to the 50s from west to east. 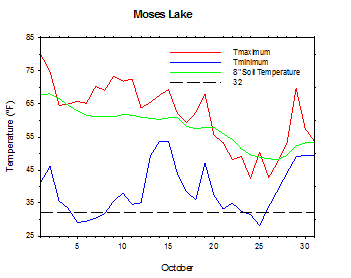 On the morning of October 5th, temperatures dropped as low as 18.4 degrees at Pullman, with mid 20s around cold places such as Moxee and Broadview. Despite warming aloft and dissipating northerly flow on October 6th, stronger inversions maintained the cold night-time temperatures. As the ridge of high pressure off the coast moved inland and strengthened over the region, sunny skies and stable conditions continued. Warm days and cool nights gave way to warming through the weekend and into the week of October 8th. October 7th was quite warm in southwestern Washington, with highs in the mid 70s to as warm as 80 degrees at Long Beach, thanks to a warm air mass and offshore flow. Day-time temperatures rose to above average levels again by October 8th, with widespread 70s. Isolated below-freezing lows continued into the morning of October 9th at a few locales, due to clear, dry, stable conditions. Day-time cooling at the coast on October 8th spread to all of western Washington on October 9th as onshore flow strengthened. October 10th was a cool day in western Washington, but another warm day in the mid to upper 70s in much of central Washington. As the ridge weakened and flattened, a strengthening jet stream induced a westerly flow over Washington on October 12th. Low temperatures increased to above average values as marine air displaced the dry, continental air. Although the first weather system to impact the region was weak, it brought light rain to western Washington on the morning of October 12th. The ground-breaking storm system opened the door to a more active pattern that featured the first substantial rainfall in several months. Clouds kept some areas seasonally cool during the day, although nights were mild due to abundant wind and moisture. On Sunday, October 14th, 1.3 inches of rain fell at Long Beach, and 1.2 inches was recorded at Tokeland. 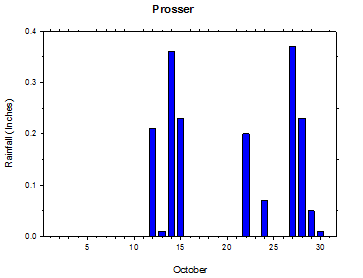 Even the Prosser area received substantial rain on October 14th. For portions of south central Washington, it was the first notable rainfall since June. Lows were in the upper 50s around the Tri-Cities, north of Omak, and in much of western Washington. The low temperature at Pasco on October 15th was a balmy 59.6 degrees, which is an October record (1995 to present) that surpassed the previous record value by 1.5 degrees. Dew points surpassed 60 degrees in many areas on October 15th, as subtropical air streamed into Washington. Very windy conditions ushered in drier and cooler air on October 16th. Winds gusted to 50 mph in some locales, while sustained winds approached 30 mph. The peak 15 minute average wind (wind gust) during the storm passage was 36.1 mph at St. John (48.6 mph at Wenatchee Heights). In fact, the National Weather Service reported wind gusts up to 66 mph in the Moses Lake area. Cooler and drier weather returned for mid week, before warming occurred late in the week. Highs were in the 50s and 60s on Tuesday, October 16th, as lows ranged from near freezing to the low 50s. 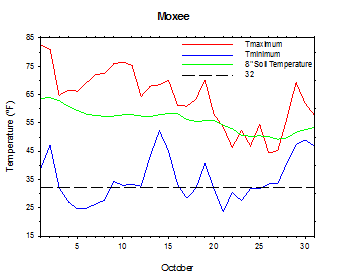 Clear skies and dry air caused a chilly morning on October 17th, with lows as cold as 28.4°F at Moxee. On the morning of October 18th, most areas were in the 30s and 40s, though a few locations fell below freezing. Additional warming occurred in parts of south central Washington overnight, as winds increased to over 20 mph hour in some locations. The breezy areas climbed into the 60s during the early hours of the morning of October 19th. Rainfall from a passing weather system amounted to nearly an inch for the Bellingham from late on October 18th and into October 19th. A passing cold front heralded the transition to cool and showery weather for the weekend of October 20th/21st. October 20th brought cooler temperatures to many areas, along with the first Cascade pass level snowfall of the autumn season. Some areas above 5000 feet received around one foot of snow over the weekend. Highs were in the 40s and 50s, with lows on Sunday morning dropping well into the 20s across much of eastern Washington. High temperatures on October 21st were as low as 44°F at Wenatchee Heights, while lows were as cold as 22°F at Broadview (near Ellensburg). Nearly 0.6 inches of rain fell at Tokeland on October 21st. Cloud cover led to milder morning conditions on October 22nd. Lows fell into the 30s to low 40s, with only a few areas dropping into the 20s. October 22nd was a particularly cold and raw day in south central Washington, with highs in the upper 30s to 40s under dark and rainy skies. The chill represented a marked change from temperatures in the 60s and 70s just three days prior. Earlier in the month, some of these same areas had been in the 80s. In fact, October 22nd was the coldest day in seven months in south central Washington. The high temperature and average daily temperature at Prosser (WSU IAREC) on October 22nd were the coolest since March 21st and 22nd, respectively. For Wenatchee (WSU TFREC), the low on October 21st of 27.3°F was the coldest since March 23rd, while the average daily temperature of 37.9°F was the coolest since March 14th. In addition, nearly 0.8 inches of rain fell at Tokeland, while more than 0.5 inches fell at Naches and Thorp. Low temperatures on October 22nd were as cold as 24 degrees at St. Andrews, while the coolest high temperature was 36.5°F at Wenatchee Heights. Lows on October 23rd were as chilly as 27.2°F at Konowwac Pass. Long Beach received another 1.2 inches of rain on October 23rd, although much of the state received little daily rainfall. High temperatures were in the 40s and 50s. 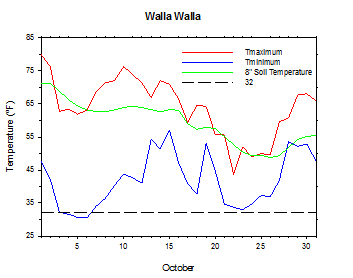 October 24th was a wet day along the East Slopes of the Cascades, as Chelan South received 0.63 inches of cold rain, and Wenatchee (WSU TFREC) registered almost one-half inch. Wet snow fell for much of the day at the higher elevation site of Wenatchee Heights, where the high temperature failed to reach 37 degrees. Cold conditions continued through October 26th, before active but milder weather returned to close out the month. More rain fell on October 27th, as warm air aloft surged in over cooler air at the surface. Overnight lows became much warmer in some places on October 28th, as highs surged into the 60s in sunny, windy parts of southern Washington. Strong winds caused a very warm morning on October 29th in the south, although northern areas continued to experience cool, cloudy, and calmer weather. Following lows in the mid 50s, highs rocketed into the low 70s around the Tri-Cities. Dew points surged above 60 at Mae in the Columbia Basin, as moist subtropical air poured into the region. Sustained winds of over 30 mph affected St. John. Rain fell across the state, as up to an inch was recorded in southwestern Washington on October 28th, while 0.75 inches fell in the Bellingham area on October 29th. Although October 30th and 31st were relatively dry in eastern Washington, heavy rain continued in western Washington. 2 inches fell at Long Beach on October 30th, while an additional 1.5 inches on Halloween brought the monthly total to nearly 13 inches. In fact, Long Beach averaged 0.6 inches of rain per day during the final 20 days of the month. Otherwise, moist, mild, and cloudy weather continued through month's end, with highs in the 50s and 60s, and lows in the 40s and 50s. 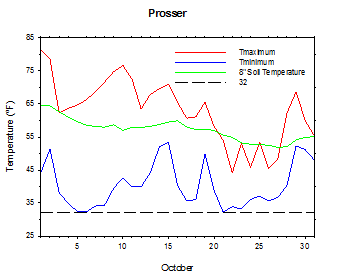 The average October temperature at Prosser (WSU IAREC) was 51.3°F, which is 0.8 degrees above average. The average high temperature was 63.1°F, which is about average (0.1 degrees above average). The average low temperature was 40.3°F, which is 1.2 degrees (0.65 standard deviations) above average. The maximum temperature recorded last month was 81.3°F on October 1st, while the coolest daily high was 44.1°F on October 22nd. 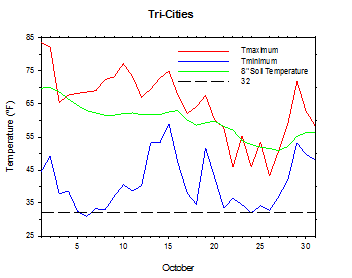 Low temperatures ranged from 53.4°F on October 15th to 32.3°F on October 21st. Daily average temperatures ranged from 62.6°F on the 15th to 40.1°F on the 24th. The monthly rainfall total was 1.74 inches. The average wind speed was 4 mph, and the average 8 inch soil temperature was 57.2°F. 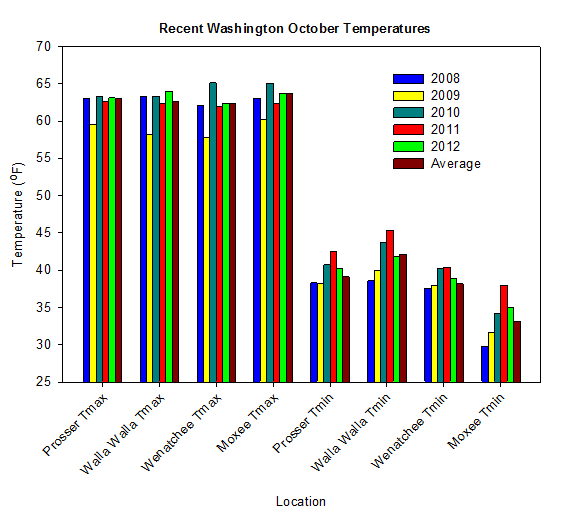 Wenatchee (WSU TFREC) recorded an average temperature of 49.7°F, which is 0.2 degrees above average. Mt. 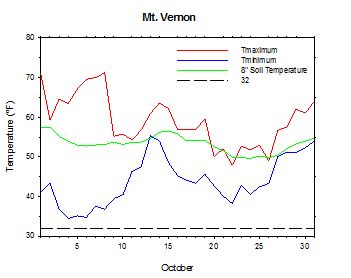 Vernon's October average temperature was 51.3°F, which is 0.8 degrees above average. October 3rd: The winds gusted to over 58 mph at Snipes in the lower Yakima Valley. 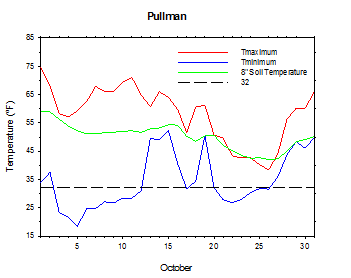 October 5th: The low temperature at Pullman fell to 18.4°F. October 12th: The streak of consecutive dry days at Pullman ended at 103 days (July 1 to October 11). October 14th: 1.3 inches of rain fell at Long Beach. October 15th: The low temperature at Pasco fell to only 59.6°F, which was an October record. 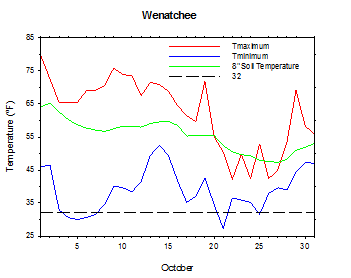 October 22nd: The high temperature at Wenatchee Heights was only 36.5°F. October 31st: The monthly total rainfall at Long Beach was 12.76 inches. October was generally a changing weather month across the state. The poor air quality finally ended in all areas by mid month, as more active conditions brought rain back to the state. The Chelan County pear harvest was complete as of mid month. As of October 21st, early planted winter wheat was up in Whitman County, while potato, onion, and dry bean harvest neared completion in Adams County. In Yakima County, frost ended the production of summer squash, cucumber, pepper, and tomatoes. The Red Delicious apple crop was larger than normal due to the prolonged dry conditions from mid-summer through early October. Rain in Columbia County provided a beneficial increase in top soil moisture, while Lincoln County producers finished the planting of fall crops. In Grant County, potato harvest was winding down, while Thurston County Christmas tree growers were putting the finishing touches on trees to be harvested this year. Overall, rainy weather during late October was good news for winter wheat crops, while simultaneously slowing the fall harvest (National Agricultural Statistics Service). On October 1st, 1992, the temperature at Moxee rose to a monthly record of 88.5°F. According to the Climate Prediction Center (CPC), near normal conditions are expected in Washington during the month of November, except that eastern areas around Pullman and Spokane have slightly enhanced odds of above normal temperatures. For the remainder of the autumn and winter seasons, drier than normal weather is expected. The outlook also suggests above normal temperatures east of the Cascades and near normal temperatures west of the Cascades in the coming months. It should be noted that weak El Niño conditions are possible for the coming winter, although the potential strength of the event is in question.